Would you like to know what he or she is thinking right now? Call me I pick up on exact emotions at the present time. I come from a long line psychics and remember my first experience at five years old. I'm also a proffesional astrologer, I went to The Academy of Astrology of England. Call to find out about Soulmate Catching Twin Flames and more. My tarot cards speak to me, I take out the card that represents the person in question. My cards are 17 years old, I also use my psychic ability to see and feel the person in question. Experience a new flavor of a reading today! Great talk, thank you. Tried to stay on but keen has so many connection issues, ugh..but advisor was on point! Absolutely amazing. She picks up on so many details. I highly recommend her!! Always true to her word. I love it. Thank you Pamela! Pamela Lee has been a user of Keen since 2015. 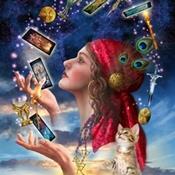 Getting Tarot Readers advice from Pamela Lee through www.keen.com is safe, secure and confidential.